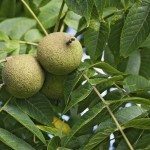 I was wondering if there was a list of vegetable plants that walnut trees will affect besides tomato plants. Squashes, Melons, Beans, Carrots and Corn are known to be tolerant of black walnuts. Everything else is susceptible to the toxicity.